Filled from Caltex GT road. Took almost one hour. Where did you find these dates? 11 Feb is written in front of FSD region but nothing is front of Lahore region. According to the plan, region-II of Punjab, comprising Lahore, Gujranwala, Sheikhupura, Sahiwal and Multan, will receive gas on Wednesday and Thursday every week. 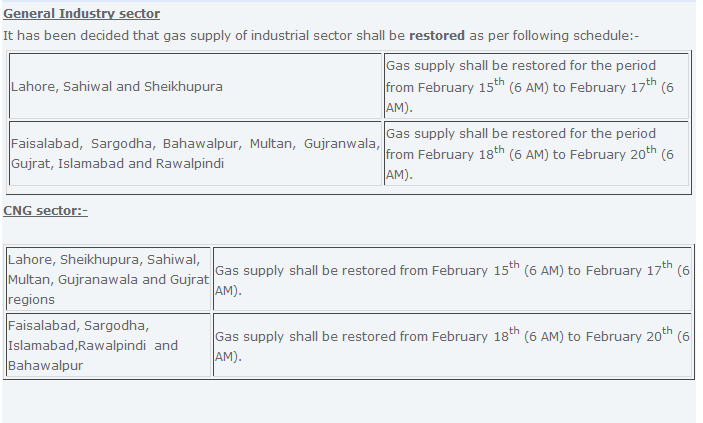 Region-I including Faisalabad, Rawalpindi and Sargodha will get gas on Monday and Tuesday. so this cng station guy gave me 4 rupees short, without even saying anything to me.i went to my cars coin box and took 6 rupees. The idiot at zoom station stopped it at 7.1 Kg, when it could have easily gone for much higher value. So frustrating when you have been in line for 20-25 mins. You guys are pretty good because I dont spare them. I dont move until unless I get all my money back. Any cng sta in f11/4? NO CNG in Lahore ..
in Azad Kasmir the electricity is cheap and available at low cost too than rest of Pakistan..
kyu kum hai 20000 bill ?